Each guest at the Carlos Fuente Sr. 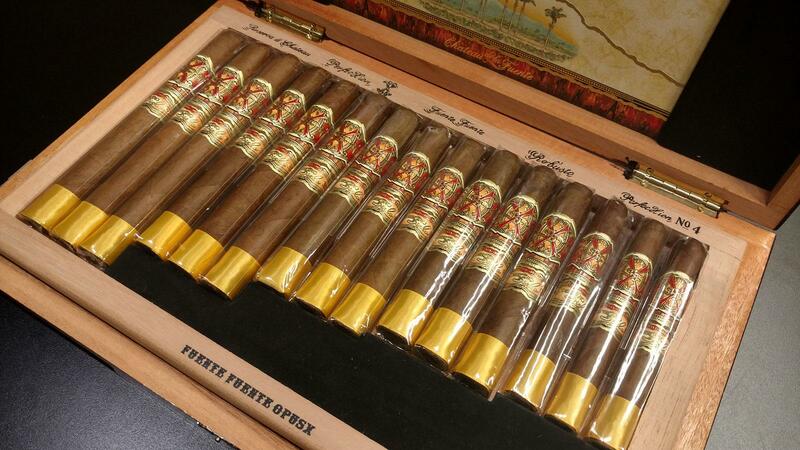 Annual Charity Dinner received a wonderful case of Fuente Fuente OpusX Destino al Siglo cigars. A weary Carlos “Carlito” Fuente Jr. took me aside, away from the crowd, near a window overlooking Fifth Avenue. We were 39 stories above street level at New York’s Grand Havana Room, where Fuente is considered royalty. Carlito looks out the window for a second or two, watching the snow come down on New York City, and then looks back at me. “I haven’t slept in a year,” he says. “Maybe two. I just got back from China. I’ve been spending a lot of time there.” He didn’t mean for vacation. Fuente is expanding his cigar dynasty and who can blame him? He’s already left a footprint in Europe, but now, he’s looking east. Our brief encounter was on the outskirts of the Carlos Fuente Sr. Annual Charity Dinner, a spendy New York fundraiser for the Cigar Family Charitable Foundation (CFCF) that attracts some of the region’s most dedicated Fuente fans. But that’s just one dinner. The Foundation as a whole has many fundraising dinners throughout the year. The CFCF is a charity created by the Arturo Fuente and J.C. Newman Cigar companies that has raised millions and millions of dollars for impoverished families and children in the Dominican Republic. The charity has built everything from schools to medical centers to sports facilities, all in the name improving the lives of those less fortunate. That night at the dinner, as the snow came down outside, I already knew that Carlito’s Arturo Fuente Eye of The Shark had been named Cigar Aficionado’s No. 1 Cigar of the Year for 2017, but this was nearly two weeks ago, before we made the official announcement, so I couldn’t say anything. I just took a puff of the Don Carlos Lancero I was smoking and nodded. Besides, Cigar of the Year was probably the last thing on Carlito’s mind. The dinner raised more than $700,000, a record for this particular Fuente event, which is put on by Jude Barbera and Bill McCuddy. They’ve been doing this dinner for seven years now, but only started dedicating it to Carlos Fuente Sr. since he passed away in 2016. Dinner started with a generous gift from Tom Celani of Celani Family Vineyards, a check for $250,000. That sure put everyone in a charitable mood. After that, an auction started. Wines, rare Fuente cigars, humidors (what else?). Carlito himself actually bought some humidors donated to the auction. They all had his father’s signature. I think he paid $10,000 just for the boxes. After the auction, Carlito finally sat down to eat. He’s always been such an elusive character. He missed the cocktail hour, mysteriously appeared once dinner started, made his rounds, spoke at the podium and spread good cigar cheer in general. Mind you, the Fuentes were out in pretty full force. His sister, Cynthia was there, as was her daughter, Christina. The spirit of the late “Don Carlos” Fuente Sr., could be felt, of course. I heard word that Carlito showed up the previous night at the Columbus Citizen’s Foundation Townhouse in Manhattan for a dinner, smoke and game of dice that lasted until sunrise. As for the goods, we got a different cigar for each dinner course. It started with a Fuente Fuente OpusX Love Story Destino al Siglo; an Arturo Fuente Don Arturo Gran AniverXario Destino al Siglo Siglo de Amor; a Fuente Fuente OpusX 20 Year Celebration (Opus Blue) Father & Son; and a Don Carlos Edición de Aniversario “The Man,” named for Carlos Senior. As a parting gift, we each received a wonderful case of Fuente Fuente OpusX Destino al Siglo cigars (shown), all different sizes. But remember, as fun as it is to collect and smoke rare Fuente cigars, it’s all for the kids. Sure, it was a great night of food and fun and cigars, but doesn’t that go without saying? Seven hundred big ones goes incredibly far in the Dominican Republic, especially through the CFCF, which is very well organized. I’ve seen the results first hand. In the middle of my table, there was a small framed photo of a young girl. No name that I saw. No backstory. At another table, another photo of a different child. I’m not sure how many people noticed these subtle reminders as to why we were all there that night. These were children whose lives are no longer a grim prospect. The Fuente family may have given us some of the greatest cigars in the world—including the Cigar of the Year, twice. But they have given these children something even better—a future.